Someone once told me that the soul travels slower than the body. Little One and I have been back in London for almost a week, but I still feel like part of my soul is still in the wide plains of central Canada, staring the the clouds scudding across the sky, moving endlessly towards some imagined horizon. Little One loves the story "The Big Red Barn," by Margaret Wise Brown, and any time we drove through the farmland she would start reciting the verses for memory. "By the big red barn in the ancient field, there was a pink pig, learning to squeal. There was a big white horse, and a very little horse..." etc. It was so wonderful to see her discovering a new landscape. Those were a few thoughts on the nature of travel. 1. Quiet. The wide, tree lined streets, with boughs creating arches as grand as the tallest European cathedral. The light slanting through the leaves as though they were stained glass windows. 2. Big skies. Extending infinitely. Clouds building structures above. Evaporated architecture. 3. Tall stacks of books to read, borrowed from my mom. And the anticipation of hours of inspiration as the seasons change. 4. Sitting in my dad’s thinking spot (thinking thoughts). 5. The quiet sounds of the house while the baby is napping. The fridge snoring (as baby describes it's hum), the floors creaking gently, and the deep breath of relaxation. 6. Evening walks after an early supper. Pushing the buggy part of the way. Letting Little One race on the sidewalk between the driveways as fast as she can, blue-glitter shoes glinting in the evening light. Then back in the buggy to push the worn-out girl home for bedtime stories and kisses. Rain washing the dust away. Brave, solitary trees, standing strong in the wind. Roads disappearing towards an imagined horizon, which keeps moving forwards as we move forwards. Last weekend we went on an "aventure" (as my toddler daughter calls it) and cycled through Richmond park and along the river to Richmond village. Then we had coffee and croissants under the tall, broad plane trees and watched the rowers sculling under the bridge. I love the sculptural shadows cast by a lovely, big summer hat. It's so fun to play with hats in my drawings. I got this hat years ago when we lived in Cape Town in a small seaside town called Hermanus. After a long, dark London winter, it is practically a requirement that your soul bursts out of your sternum with joy with the light returns and colour explodes from every corner of the natural world. One such, joyful, exuberant morning we ventured across the river to Strawberry Hill House. It is a jewel-box home, and the inspiration of Horace Walpole, man of letters and gothic novelist. Every corner was bathed in the prismatic light from the stained glass windows. And each room was unique, imaginative and eccentric. There is always something to be inspired by in our neighbourhood. Sometimes life feels busy and frantic and I forget to "look" around me. If I stop for a moment (even the shortest interval between breaths) and try to really "see," I am always amazed by the beauty surrounding me. A week in Skiathos, an island off the coast of Greece, was like a week on another planet. The sunshine was clear and bright, as if it had been focused into its brilliance through a huge lens or prism. So different from the hazy, diffused light of London. The air smelled of sea salt and pine resin. Soft pine-needles cushioned my feet on the hard, red, rocky earth. I spent a lot of time sitting on our small balcony staring at the horizon. The Mediterranean rippled slowly towards shore, like someone was smoothing the creases out of a silky, indigo tablecloth. In one moment it was velvety blue, then immediately after it shone cerulean like the sky. In the distance floated hazy mountains with clouds slowly gathering at their summits. There would be torrential rain that night. Again, so different from London rain. It fell violently; the only thing slowing it down was terminal velocity. How happy we were as we ate olives and tzatziki, baked aubergine (eggplant), and feta cheese. The local retsina (white wine) was fresh, crisp and light. As we packed our bags, which were as full of beach sand as clothes, we resolved to take an early autumn trip to Greece every year. Don't miss a word! Get my blog delivered to your inbox. Here is the story of our trip to Manitoba in daily drawings. The clouds in the sky spoke volumes. Toddler cuddles were filled with whispered songs and stories. And the waves of Lake Winnipeg recited haikus as they lapped against the stony shore. 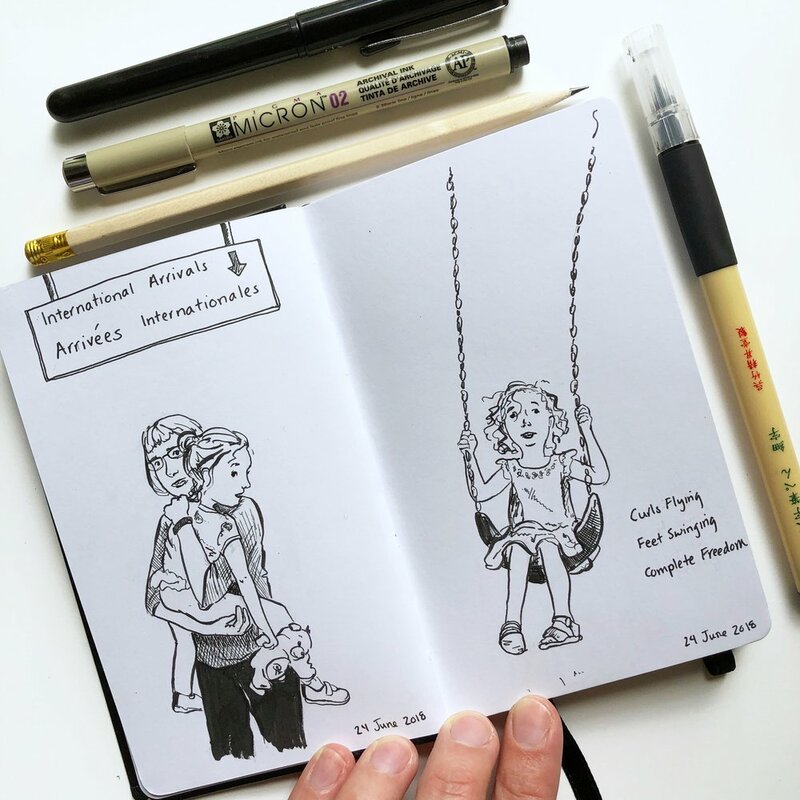 I have been trying to capture small moments from our trip to Manitoba in my sketchbook. Going through boxes of memories in the attic. In February we made the long trek to Johannesburg and Namibia to celebrate my sister-in-law's wedding. We frolicked in the sandy desert and I enjoyed sketching the out-of-this-world scenery. If you like these sketchbook pages, please feel free to share on Facebook, Pin on Pinterest or Tweet to all your friends! What have you been up to in the past month? The seasons are changing from gloomy winter to glittering spring and we're gradually settling into our new little house. I'm so grateful for the feeling of new beginnings; new home, new ideas, new routines, new excitement for life! Here are some pages from my sketchbook. I spent two days working in the grand theology room at Gladstone’s Library. I desperately needed some peace, quiet and rest after 10 strenuous months of motherhood. My mom and M looked after baby while I burrowed into hibernation in North Wales. I set up my computer, my notebooks, and all my other resources (pens, paper) and hoped that both motivation and inspiration would be close at hand. The library reminded me, nostalgically, of my studying days; sitting in the Warburg with piles of books, trying to sift through citations and notes to discover some clear ideas about art history. It felt similar being at Gladstone's Library. I wasn't actually there for the books, but for the "bookish" atmosphere. I wanted to sit quietly in a place inspired by, and completely passionate about, books. So there I was; with all my supplies; ready to work; but with no idea what I should be doing. I revelled in the quiet, dusty smell of old books, with their tooled bindings and leather covers. I heard the hushed whispers of other studious folk. Their fingers tapped their computer keys (were they more inspired that I was?). They shuffled papers. Every so often quiet sighs of contentment or frustration echoed in the vaulted hall. It’s so much easier to “want” to write a story than to actually write it. I could feel the emotions of the story running in an undercurrent, through me, like an invisible river. But I was having difficulty becoming quiet enough to plumb the depths. You will be compulsively driven to work or read at Gladstone's Library... because there isn't much else to do. If you wanted to procrastinate: you could walk up the hill to Hawarden Castle and back; you could have a coffee at the Gallery Cafe or a glass of wine at one of the two local pubs; you could stare at photos of houses for sale in the windows at the two estate agents on the high street (so much more affordable than London! ); or you could read the names of all the departed souls on the gravestones at St. Deiniol's chapel. That pretty much exhausted my (very creative) efforts at procrastination. And then I gratefully returned to the library, my stack of notebooks, and my thoughts. I work best amidst a little commotion. The washing machine spin cycle; builders erecting scaffolding across the road; groceries being delivered; they all create a feeling of time being very precious. If I tell myself I have an hour before Little M wakes up from her morning nap and I need to finish "x," I often accomplish far more than I could have expected. This made me confident about returning home with a renewed sense of purpose and an enthusiasm to work in the midst of our busy household. Gladstone's library is a bibliophile's dream. It is the only "residential" library in the UK; which means it is a simple hotel housed within an amazing library. It has a bar, a cafe serving very good food, a chapel, and books, books, books. The bedrooms are basic, but have everything you might need, except a TV (...which is in one of the lounges. The assumption is that you didn't come to the library in order to lie in bed and watch telly). And it is amazingly affordable! I would return in a heartbeat. It's the perfect place to both "get away from it all" and gain a bit of inspiration. My stay at Gladstone's library was everything I wanted it to be. I had solitude and rest in spades. I read. I wrote. I fleshed out the idea for a new story. I planned. I imagined. I daydreamed. In the end, I left refreshed and rejuvenated, and eager to return home and bury my head in Little M's curls. Fancy your own quiet weekend amongst the books at Gladstone's Library? Feel free to pin the photos, heart the post on bloglovin, tweet it, or share it on Facebook. And, make sure you subscribe or follow along to get even more weekly inspiration and follow along in my creative journey. There are few places in the world where I can feel my heartbeat slow the moment I arrive. Zell am See was one of those place for me. It is a tiny, quaint town on the edge of a cold, glassy lake. It is nestled between forested and snowy mountains on all sides. Clouds gathered and dispersed between the peaks like ancient Chinese calligraphy paintings, bringing intermittent snow or sun depending on their moods. 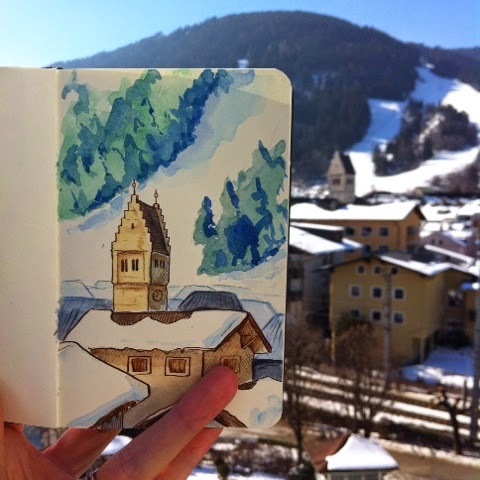 Church bells echoed between the steep gables of the medieval chalets, and people clomped up and down the cobbled streets in their ski boots with looks of anticipation and excitement on their faces. As I walked through the narrow medieval alleys, I took deep breaths of sweet mountain air that made my toes tingle. We stayed at the Grand Hotel, as they had all inclusive meals. We didn't want the extra stress of having to go to restaurants with our little four month old baby. Their food and service were excellent. Included in the price were breakfast, an après ski snack in the bar/lounge, and dinner. They accommodated us with our baby in every way they could. For non-skiers, there is a lovely walking path that circles the lake. Should one want to make the full circuit, one could walk for 10km. I did almost daily walks to the small village of Schüttdorf and back. I watched the ducks and swans paddle in the open water between ice sheets, and trace clumsy footsteps across the snow. You can walk to the main lift station in Zell am See, which is 5 minutes from the town centre, or take regular buses to various other lift points. If you want a bit of an outing, there is the nearby Kitzsteinhorn glacier, with offers amazing skiing at high altitudes. The food at our hotel was classic and tasty, but not excellent. There were three set menus to choose from, always including a vegetarian option. After a few days we realized that we could mix and match choices from the various set menus, which gave us a huge selection of dishes to choose from. Austrians seem obsessed with putting knödel in everything. Dumplings here, dumplings there, dumpling dumplings everywhere. I was incredulous when the evening menu at our hotel listed tiramisu with dumplings (how was that even possible?). It was surprisingly difficult to find a good cup of coffee. , that served amazing coffees and cakes (though receiving friendly service was a bit hit and miss). While we were in Austria I was able to take few hours off from childcare and spend the day wandering around Salzburg. The cold, blustery wind stung my cheeks, but nothing would dampen my enthusiasm for this small, picturesque little city. I wandered the streets, got lost, found myself again, and admired the sorbet-coloured baroque buildings: pistachio, strawberry, raspberry, vanilla. Distances aren't large in the old part of the city, but the streets are arranged like a labyrinth, so getting anywhere takes time and a keen sense of direction. The sun shone brilliantly, making the gorgeous city sparkle. And, in sheltered corners, it was just warm enough to loosen my scarf and open my jacket while sitting on a park bench. At noon I pulled out the lunch I had packed from the hotel's breakfast buffet: a small brown roll filled with holey swiss cheese, and ate while basking in a warm sunbeam. The old part of the city is called the cathedral district because there is a huge church on practically every street corner. On the hour, every hour, the various church bells chimed in unison, creating a reverberation of sound across the city. Salzburg is famous for being the birthplace of Mozart. He was born in a narrow yellow house, on a narrow little street, in the old part of the city, and he was baptized the day after his birth in the cathedral. I decided not to go into the house, which has been turned into a museum, but rather honoured my love of Mozart by humming my favourite parts of his compositions while I wended my way up and down the cobbled the streets of the city. As I walked past the concert hall, near the castle, I saw a glint of gold flashing from a high window. When I looked more closely I saw that it was someone practicing the French horn; he was aiming the flared bell of the instrument at the window so that all the passing traffic could hear the jaunty rising phrases of a Mozart horn concerto. The theme floated into the cold spring air and echoed between the ancient buildings. Salzburg makes the most of their "Mozart" connection, and have even invented a chocolate truffle named after him. It is a sphere made of concentric layers of pistachio marzipan, nougat and chocolate. Both delicious and addictive. Salzburg actually means "Salt Fortress" in German. Salt was mined in the mountains nearby and, in the middle ages, barges carrying salt up the Salzach river had to pay a toll in Salzburg. 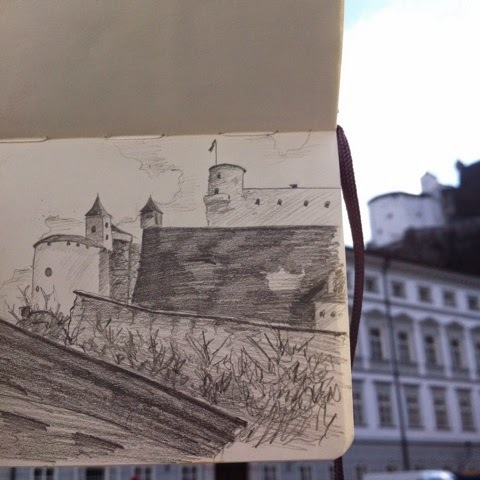 The castle, perched high on the hill above the old town, called the Festung Hohensalzburg, was started in 1077, and it was hugely expanded in the following centuries. I decided to walk the narrow, precipitous path to the toll gate rather than take the funicular, because I wanted to tread those same stones that medieval travellers might have trodden on. The climb was hot and exhausting work, and I couldn't help myself from breathlessly singing the German hymn. "Eine feste Burg ist unser Gott." (A mighty fortress is our God). The medieval genius of the castle was astounding. For, had any invader successfully breached the steep castle walls (or made the climb without keeling over from exhaustion), they would have found themselves getting deeply lost in the spiral-shaped labyrinth of paths and ramparts that guarded the archbishops fortress in the centre. Even I, with my tourist map, got completely confused, and failed to find the same footpath that had led me in. I ended up taking the funicular down to save energy and time. The views from the top of the castle walls was astounding. I could see the entire town of Salzburg laid out below me like a miniature city, and the ring of snowy peaked Alps in the distance. Just for the fun of it, I challenged myself to only speak German for the day. It's easy to get the feeling that you know a language when you can order a cup of coffee, and they don't look at you askance, or ask for basic directions, and not make a fool of yourself. So, I considered my foray into the resurrection my German to be a success. At least I could understand and communicate. (the former far better than the latter). Sometimes I find it astonishing that anyone can understand my German at all! However, when it comes to holding more involved conversions, my language skills are sorely lacking. ... I passed the long train journey reading Helen McInnes's book "The Salzburg Connection," which is a cold war spy novel set in Salzburg and Zurich. It is a fast paced, if slightly dated novel, filled with stereotypical intrigues. The amateur sleuth gets caught up in a mystery that's over his head, he meets CIA agents, an impossibly beautiful and seemingly-vulnerable femme-fatal, and acquires a smart, sassy (and also beautiful) sidekick. Of course, good prevails and the guy gets the gal. Woven through the plot are McInnes's atmospheric descriptions of Salzburg and the Austrian mountains and lakes nearby. Do you want more armchair adventures? Did you like this post? Feel free to click below to share with your friends on Facebook, Pin it to Pinterest, tweet about it on Twitter, or favourite in Bloglovin'! 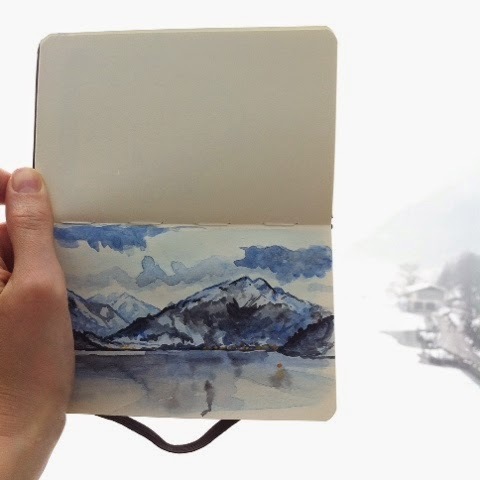 We have spent the week in Zell am See, Austria, where my husband snowboarded and I relaxed with Little M and filled my sketchbook with Alpine views. 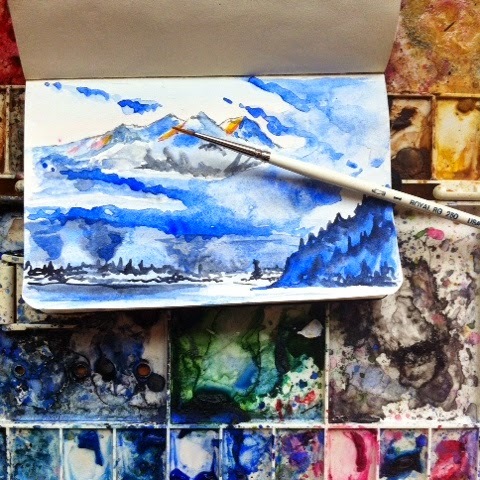 I packed a minimalistic art kit: a tiny moleskine sketchbook, a few pens, pencils and brushes, and a small palette of watercolour paint. I felt a bit confined by the small selection of supplies, but that's not a necessarily a bad thing when it comes to art. Sometimes limiting the options forces one to solve problems more creatively. 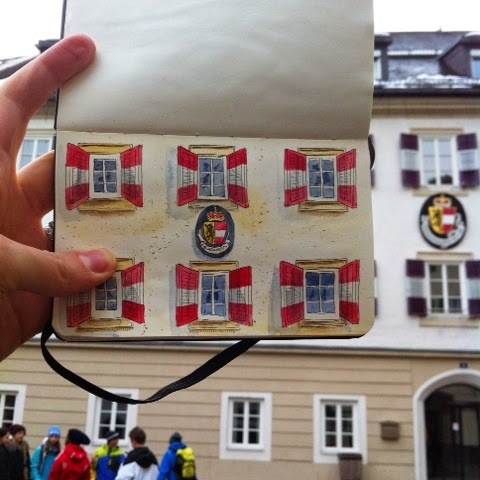 I'm planning to do two travel posts in the next week to highlight the beauties of Zell am See and Salzburg. But, for now, I'll just share my little sketches. I was going through my hard drive the other day to back up my files, and I found the photos from my Easter Break trip to the Netherlands. It seems ages ago; almost like it happened in a dream. Even though it was so long ago, I thought I'd share a few of my favourite pictures, or else they'll keep gathering dust inside my MacBook. At the time I was newly pregnant, and suffering severe nausea. I tried my best to make the most of the holiday and enjoy being a tourist, but to be honest, most nights I ended up curled up in bed wishing I were home. Having said that, the Netherlands is one of my favourite countries in Europe. I love how small it is, and that you can cover its terrain from one side to the other easily in a day; practically any town is accessible as a day trip. My mom and I stayed with a good friend who lives in Bloemendaal, a small town just outside Haarlem, and a short train journey from Amsterdam. It is a gorgeous community nestled beside the blustery North Sea. In the evenings we took long drives along the coastal roads to admire the sunsets, the swaying beach grasses, and the brave kite surfers. Amsterdam is not my favourite place in the world. Every time I visit the Netherlands I resolve to find something to love about the city, but aside from the museums, I always find it hard to warm to the place. As far as I'm concerned it's full of noisy tourists, hippies and teenagers that reek of weed, street trams and bicycles racing in every direction (so you never know when you might be run over), drifts of litter, and annoyed dutch people (I'd be annoyed too, if I had to deal with all the aforementioned). If you want quaint canals, gorgeous dutch architecture and tulips, there are much more beautiful places to visit than Amsterdam. It has a stellar collection of Vermeers and Rembrandts, and much more. Plus a great cafe if you want to rest your eyes, feet and sample some nouveau dutch cuisine. Van Gogh's paintings are so full of life and emotion; seeing them always leaves my heart both full of joy and a little raw. This is the only floating flower market in the world. It blooms with fragrance and colour in any season. These are the small towns and cities that epitomize everything I love about the Netherlands: glittering canals, gracious city squares lined with cafes and restaurants, amazing museums, and friendly people. Visit the Frans Hals museum and wander the narrow streets tracing webs around the wide canals. Visit the Vermeer museum and buy some stunning blue and white Delft ware china. The central square is long and narrow, and has a tall tower to climb so that you can see the whole town laid below you, as well as the all horizons of this small, flat, little country. A bustling university town filled with trendy students and great restaurants and cafes. It was the birthplace of Rembrandt. The centre of Dutch government. Every street is lined with chic boutiques, gracious palaces and government buildings. In the spring, this is the ultimate place to see more tulips than you could ever imagine. We happened to go on the day of the flower parade, which made the gardens and nearby town very festive. Go early in the day to avoid the crowds. A gorgeous university town with lovely cafes, boutiques and a church tower near the main square that plays a full carillon (a song played on the bells) at midday. It's the perfect place to sit for lunch while listening to the pealing bells and water lapping in the canals. 1. Make sure you try a stroopwafel with your coffee. This is a small biscuit or cookie made with two thin layers of waffle filled with caramel. To soften the caramel you lay the waffle on the rim of your cup so that the steam warms the sugars. There's no need to dunk. 2. Vla. This is a dutch version of pudding or custard, but so much better. 3. Go to a Pannekoeken Huis. The dutch serve their pancakes almost like pizzas, with numerous sweet and savoury toppings. The best pancake houses are in the smaller towns and rural areas. 4. Cheese. There are cheese at every corner with windows stacked with delicious looking blocks and wheels of cheese. Make sure you pop in and sample some of the local delicacies. Have you been to Amsterdam or the Netherlands? What's your favourite thing to see or do? Or, Do you have a favourite holiday destination that you keep going back to time and time again? I can hardly believe that I'll be leaving Cape Town today. When we first moved here I didn't want to stay. The adjustment to the new city, the new culture and the new routines (including security worries) was difficult; I wanted to turn right around and fly back to London. But now that I've spent 3 years here, I've come to love the city like a second home. I love the warm, generous people; I love the vibrant mish-mash of cultures; I love the mountains and the sea. I'm so excited to be heading back to London; the timing is right in so many ways. And I can't wait to share the next chapter of this adventure with all you lovely readers! But, even with all this new excitement, it doesn't mean I won't be thinking longingly of Cape Town from time to time. -- Our gorgeous courtyard garden, filled with lavender, frangipani, bougainvillea, mint, rosemary, wisteria, and the world's largest grape vine. , and all my wonderful ballet friends. -- The noon gun, which has been marking midday since 1806. The cannon blast reverberates around the city and lets me know when it's time to eat lunch. -- The view of the sheer face of Table Mountain every time I step out of our front gate. So impressive. -- The wind. I have a love/hate relationship with the Cape Town wind. Sometimes it's so extreme that I'm convinced our stone house will be picked up like a feather and blown down the hill into the harbour. -- Driving around the hills and mountains and staring at the sparkling sea. -- My small studio in our house with a view of our courtyard and a glimpse of Devil's Peak above the roof. -- Sundowners: the ritual of drinking a glass of something exquisite and watching the sun slip below the waves.
. Nothing can beat them! There are burritos, and then there are Tortilla burritos. Nothing I've had in the States even comes close to the explosion of flavours in each bite. -- A leisurely braai (BBQ) in my in-laws' garden, playing with their dogs and chatting aimlessly about what's been happening in our lives. -- Our house. It's a 150 year old (or more) cottage built with stone quarried from Table Mountain. It gives off an amazing, deep, spiritual energy the minute you walk in the door. I wonder who has lived here before us and what stories the old stones could tell. We've been part of that long story, and soon new people will be adding their chapters. -- The extreme heat in summer. My father-in-law always teases me that I spend the summer with my head stuck in the freezer. -- Constantly fighting the populations of cockroaches and other prehistoric looking insects (trilobites anyone?) that invade our house from time to time. -- The homeless people who sleep outside our garage door every winter. I feel deeply sorry for them, but they're a nuisance all the same. -- Hadedahs. These birds commute from the mountain into town every day, flying right over our house, and then back again in the evening. They're big, ugly and sound like dogs with chest colds laughing when they "honk." -- The huge, high garden walls, burglar bars, security systems, and barbed wire that turn every house into a fortress. What are your favourite things about your home town or city? Why not share a few in the comments? - I arrived home, acquired a vicious head cold, and immediately dove head-first into work towards some looming deadlines. - I'm resolving to do more landscape sketching/painting, and this is the fruits of my first effort. Yesterday the full moon was spectacular, inspiring, uplifting. - The moon always reminds me to breathe deeply. The world is bigger than we imagine, much bigger. There are possibilities of all description beyond our reckoning. When we're worrying about our little patch of earth (our careers, families, etc), sometimes a larger perspective is important. As Anne of Green Gables said, "The sun will keep on rising or setting, whether I fail geometry or not."